A wealth of problem-solving practice in the format that you want! This book is the ideal way to sharpen skills and prepare for this MCAT topic. 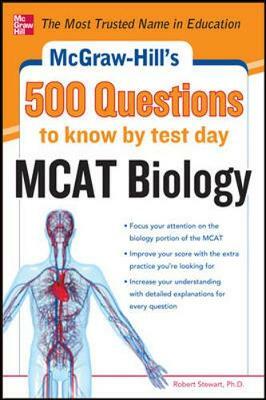 Get the problem-solving practice for biology you need with McGraw-Hill's 500 MCAT Biology Questions to Know by Test Day. Organized for easy reference and intensive practice, the questions cover all essential topics and the answer key includes detailed explanations for each question. Inside you'll find: 500 MCAT biology questions organized by subject; detailed solutions to every problem given in the answer key; expert coverage for topics covered by the MCAT.